What happens if I reap with a creature that has the Silent Dagger upgrade and there are no enemy creatures? You always resolve as much of an ability as possible. In this case, you would deal 4 damage to one of your own flank creatures. If I place Silent Dagger on a creature that already has a “Reap:” ability, do I get to use both abilities when that creature reaps? Can I play Silent Dagger on an enemy creature, allowing me to gain the Æmber bonus? Yes. The first step in playing any card is to receive the Æmber bonus, if any. Then, unless otherwise stated, an upgrade can be played on any creature, including enemy creatures. If there are no creatures in play, can I still play Silent Dagger to gain the Æmber bonus? No. 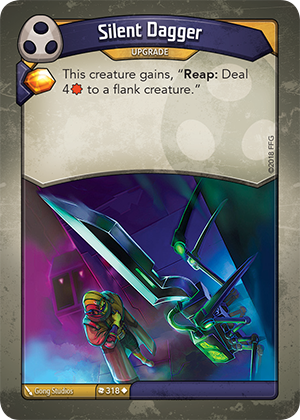 If an upgrade (such as Silent Dagger) cannot attach to a creature in play, the upgrade cannot be played. Therefore, you could not play Silent Dagger in that scenario and no Æmber bonus could be gained.